Reliable bed wetting alarm programs in Brisbane and AUSTRALIA WIDE! We provide a professional bed wetting program for children in the Brisbane area & Australia Wide. Our professional staff run a bed wetting program with the aid of our bed wetting alarms. For more information on how your child will stop bed wetting with our alarms, contact us today. At Civic Fair Pharmacy, our staff are experienced in running a professional bed wetting program with the aid of our Ramsey Coote Bed Wetting Alarms. Wetting the bed at night (nocturnal enuresis) is very common in young children and can be normal up to the age of 5 years. About 10% of 5 year olds still wet their bed. At age 10 only half of these children if unaided, will become “dry”. The good news is that for many, an effective treatment is available using Ramsey Coote Enuresis Alarms. Bed wetting alarms are considered the most useful and successful initial way to treat bed-wetting. Research has shown these Ramsey Coote alarms will help more than 80% of children become dry. This treatment requires a supportive and helpful family and may take 8 to 10 weeks to work. Initial consultation and continued guidance throughout treatment contribute greatly to children becoming dry. The key to success is a positive, caring treatment program. Ring Civic Fair Pharmacy on (07) 3349 7196 today to enquire about our bed wetting program. Our professional continence advisor will contact you for a free consultation. At Civic Fair Pharmacy we supply our Brisbane and Australia wide customers with the leading bed wetting alarms and programs at affordable prices. We run a program for our customers with the aid of our bed wetting alarms, helping their children stop their bed wetting problems. We are a local pharmacy with over 15 staff. 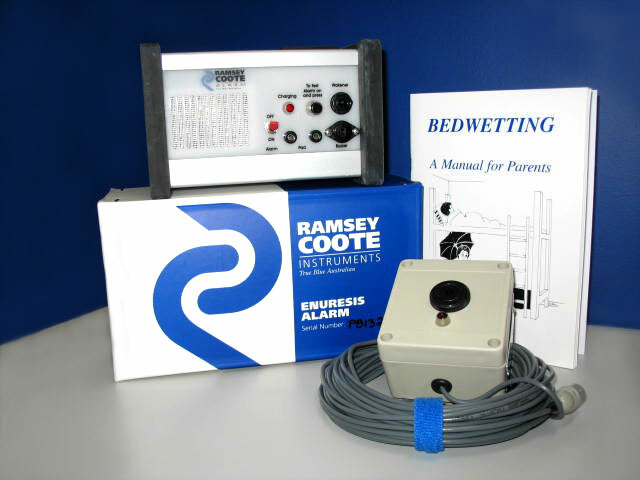 We supply Ramsey Coote products, the leading supplier of bed wetting alarms in Australia, ensuring that our customers will receive the best bed wetting programs for their child. No bed wetting issue is too big or small for our staff. So please contact us at Civic Fair Pharmacy for more information on our bed wetting alarms at our Brisbane store. We provide family oriented bed wetting programs to ensure your child feels comfortable. Our staff provide a personal and professional service to our customers in Brisbane. We pride ourselves on being professional at all times to help with you child's bed wetting. All of our staff members are extremely friendly and welcoming throughout all of our bed wetting programs.